People outside the industry hear the words “field service” and, if they’re even familiar with the term, probably just think about the cable guy who helps them connect to the WiFi. However, those on the inside know that this industry is booming with innovation at every turn. New technology like the cloud, Internet of Things (IoT), virtual reality (VR) and driverless cars all have a role to play in the next era of field service management software. To help you prepare for all the changes coming to the industry, we’ve come up with our perspective regarding field service management trends and predictions. Cloud field service management will be the main disruptor to the industry in the next few years. New technologies will be introduced to field service, with 60 percent of FSM companies planning on implementing IoT in the next 10 years. Over 50 percent of FSM consider “soft skills” a high priority, putting a major emphasis on this skillset as businesses hire a new generation of technicians. Driverless cars could be coming in 2030 to save businesses up to $500,000. Responsiveness and professionalism when interacting with customers are must-haves for any successful field service business. As the front-line agents of field service, the role of the technician in ensuring a positive customer experience is crucial. In order to support their efforts and maintain this level of excellence, field service operators will turn to mobility solutions as one of their most valuable and productive tools. The ability to work online, through the use of a wide range of applications and devices, offers the workforce an optimized ability to perform in a productive and informed manner. Think about some of the most common issues field service organizations currently face. Issues such as reduced productivity, lack of real-time information, dissatisfied customers and reduced profitability likely come to mind. What makes mobility so important to field service is its ability to bring up-to-date data to the field, helping to solve many of the issues listed above. For instance, rather than phoning office staff every time an obstacle arises, a technician can solve many of their own issues with field service mobility software. Today’s cloud FSM software allows technicians to quickly compensate for issues like jobs going over time and out of stock parts. Because your technicians are connected online, the data surrounding these issues is instantly processed within the cloud system, which then generates new schedules, alerts customers to delayed appointments, sources parts from nearby technicians and more. When field service processes are integrated with mobile field service software, the results translate very directly into an optimized customer service experience and, as a result, increased revenues. Notably, mobility, as the critical partner in this industry, is only possible because of the strong presence of cloud technology. Mobility is the main driver of transformation in the field services industry today. If this sounds hyperbolic, consider the benefits that mobile technology delivers to field service management. Mobility provides a centralized, knowledge-based platform that gives technicians access to data wherever and whenever they require it. This ability is key to maximizing performance in all areas of the field services enterprise. Access to data can hasten and improve the resolution process, extend a company’s reach to its customers and maintain a more lean and productive organization. 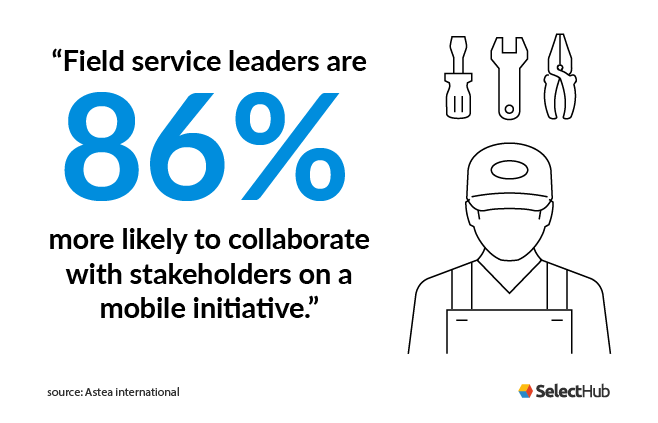 This relationship with mobility is a win-win scenario for field service businesses everywhere. Consequently, the next year will witness an increased investment in mobile technology by businesses in this industry, as it affords a truly competitive edge. According to a Worldwide Business Research report, almost half of surveyed FSM organizations identify automation as leading to the greatest revenue growth. In the same report, augmented reality was identified by 33 percent of respondents as a technology that they would implement in the next five to 10 years. Almost 60 percent of respondents said the same for full implementation of the Internet of Things (IoT). Implementing these technologies goes hand in hand with the movement toward mobile FSM solutions, as interconnected devices and up-to-the-minute data become the norm. Having access to the best possible information and support is, quite clearly, a very critical aspect of a field service technician’s job that has the greatest impact on facilitating a successful customer interaction. But technology and knowledge alone cannot guarantee a positive outcome when interacting with customers. According to WBR, over 50 percent of field service companies rank training technicians in “soft skills” as one of their highest priorities. However, interpersonal skills are not usually a natural partner with highly technological skills; therefore, there is a real need to develop and encourage the interpersonal side of the equation among field service employees. In addition to training existing employees on new technologies, businesses will also have to spend much of 2019 focused on recruiting. Stratistics MRC predicts that the field services industry will grow to reach 4.45 billion dollars by the year 2022. And with Baby Boomers leaving the workforce, companies will need to get serious about hiring new talent to keep up with demand. For the past few years, every field service management predictions piece touched on driverless cars and when we might see them. It’s no wonder why this technology is such a hot topic in the realm of field service, as it would drastically impact how technicians spent their time. However, as the technology develops, we’re starting to see that it’s likely going to take more time than we initially thought. In this 2015 Forbes article, the then-CEO of Ford, Mark Fields, thought we would see the first fully automated vehicles by 2020. But a 2019 article from Automobile Mag states we won’t see completely driverless vehicles until 2030, if at all. Although fully autonomous vehicles would require zero driver attention, experts in the article suggested that we might never see a tipping point in the market for this technology. That’s because highly autonomous vehicles (which need driver attention in only specific conditions) will likely satisfy the needs of the market. This means FSM companies will likely see the same challenges when it comes to fleet management but also won’t have to worry about a massive disruption in the industry for at least the next ten years. Field technicians will additionally have to continue spending a large amount of their time driving. And because your technicians can’t document jobs or source parts while behind the wheel, you’ll have to consider tools and strategies to optimize your technicians’ time. This increases the relevancy of mobile FSM solutions in the coming years, as businesses will need to be connected to their technicians and support them with tools that make their job easier. For instance, many field service companies may want to consider an FSM with note-taking capabilities, pre-defined task lists and more. But just because driverless cars are further away than we initially thought, doesn’t mean they won’t ever come. So what will field service businesses look like in 2030? Field Service News reports that with completely autonomous vehicles we could see improved fleet efficiency. Rather than simply sitting at a job site while a technician completes a task, a completely autonomous vehicle could drop off a part for another technician or even transport other workers to their jobs. Even a vehicle that’s not completely autonomous could reduce fleet accidents associated with human error, saving between 16,000 and 500,000 dollars. Although the cloud may seem less exciting than the technology involved in driverless cars, virtual and augmented reality, and the IoT, it’s the foundation that makes all the others accessible to field service businesses. Connecting field service technicians to all the resources available to them will be the only way to compete as this industry gets more competitive and customers become less forgiving. To find the best cloud FSM solution for your business, check out our field service software comparison report. It compares the top ten FSM solutions using evaluations from our analyst team based on ten different key requirements. See how the best systems compare when it comes to things like scheduling, work order management, routing and more. What field service trends do you think we’ll see in the industry in the coming years? Let us know in the comments below.